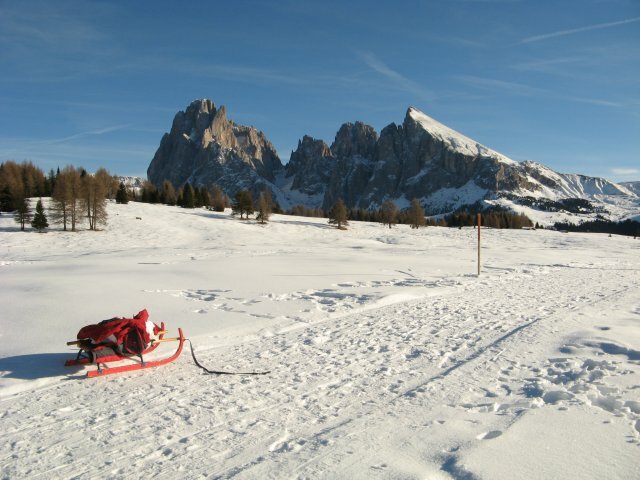 Val Gardena is a paradise for sledging enthusiasts. Whether you are looking for an easy route or a challenging descent: there is something for everybody. Full moon sledging: Enjoy the silent and fairytale snow covered winter landscape under the full moon and descent with the sledge to the valley after a cosy dinner at one of the many mountain huts. If you don’t have a sledge you can hire one at a convenient price at most of the mountain huts. Ortisei offers 6 km long sledging run from the top station of the chairlift down to Ortisei. the sledging run at the chairlift Panorama on the Alpe di Siusi or at the Passo Pinei. With bus transfer, snowcat drive and dinner. Please notice that it is strictly forbidden to sledge on the ski slopes!